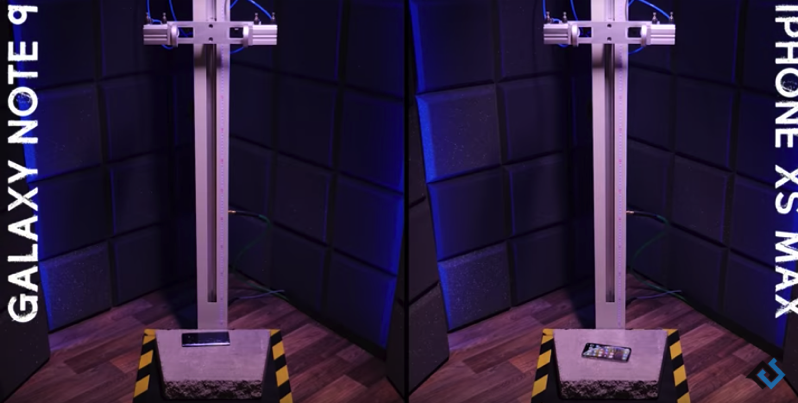 YouTube channel PhoneBuff has published a video today putting Apple’s iPhone XS Max against the Samsung Galaxy Note 9, in a drop test, using their professional drop test machine. Apple boldly claimed at their special event earlier this month the iPhone XS and iPhone XS Max has the “most durable glass ever in a smartphone.” This line has spurred more drop tests than usual as YouTubers try to verify Apple’s claims (#imherefortheviews). Each phone faced a drop onto its back, corner and front screen. The special bonus round saw at the iPhone XS Max drop ten times at just under five feet. At three bonus drops, the towel was thrown in on the XS Max, as the top part of the display saw Multitouch go wonky. Despite scoring three perfect scores of ten against the Galaxy Note 9 in the first three rounds, the iPhone XS Max ‘lost’ in the bonus round, which lowered its overall score to 36, versus the Galaxy Note 9 at 37. Click here to watch PhoneBuff’s iPhone XS Max versus Galaxy Note 9 speed test video.